Philip Dorling is an Age investigative journalist. Bribery, corruption and self-enrichment: secret US cables reveal serious allegations of abuse of power by Indonesia’s President Susilo Bambang Yudhoyono and his wife Kristiani Herawati. Philip Dorling reports. WHEN Susilo Bambang Yudhoyono won a surprise victory in Indonesia’s 2004 presidential elections, the Unites States hailed it as “a remarkable triumph of a popular, articulate figure against a rival [incumbent president Megawati Sukarnoputri] with more power, money, and connections”. Even three years later US diplomats in Jakarta applauded Yudhoyono’s administration for remaining “stalwart in its commitment to put terrorists behind bars”. Indeed, the former army general and security minister went on to win international accolades for strengthening governance, promoting economic reform, and his efforts to suppress the Islamic militant group Jemaah Islamiyah. But Yudhoyono’s record may have to be reviewed after secret US embassy cables, leaked to WikiLeaks and provided to The Age, reveal allegations of corruption and abuse of power that extend all the way to the presidential palace. However, the embassy’s political reporting, much of it classified “Secret/NoForn” – meaning for American eyes only — makes clear the continuing influence of money politics, which extends, despite the President’s public commitment to combating corruption, to Yudhoyono himself. The US embassy cables reveal that one of Yudhoyono’s early presidential actions was to personally intervene in the case of Taufik Kiemas, the husband of former president Megawati Sukarnoputri. Taufik reportedly used his continuing control of his wife’s Indonesian Democratic Party (PDI-P) to broker protection from prosecution for what the US diplomats described as “legendary corruption during his wife’s tenure”. Taufik has been publicly accused, though without charges being laid against him, of improper dealings in massive infrastructure projects heavily tainted with corruption. He is believed to have profited from deals relating to the $2.3 billion Jakarta Outer Ring Road project, the $2.4 billion double-track railway project from Merak in West Java to Banyuwangi in East Java, the $2.3 billion trans-Kalimantan highway, and the $1.7 billion trans-Papua highway. In December 2004, the US embassy in Jakarta reported to Washington that one of its most valued political informants, senior presidential adviser TB Silalahi, had advised that Indonesia’s Assistant Attorney-General, Hendarman Supandji, who was then leading the new government’s anti-corruption campaign, had gathered “sufficient evidence of the corruption of former first gentleman Taufik Kiemas to warrant Taufik’s arrest”. However, Silalahi, one of Yudhoyono’s closest political confidants, told the US embassy that the President “had personally instructed Hendarman not to pursue a case against Taufik”. No legal proceedings were brought against the former “first gentleman”, who remains an influential political figure. US diplomats reported that, with 243 votes required to win a majority, the Golkar chairmanship would have cost more than $US6 million. The US embassy cables further allege that Yudhoyono had then cabinet secretary Sudi Silalahi “intimidate” at least one judge in a 2006 court case arising from a fight for control of former president Abdurahman Wahid’s National Awakening Party (PKB). According to the embassy’s contacts, Sudi told the judge “if the court were to help [Wahid] it would be like helping to overthrow the government”. The intervention of “SBY’s right-hand man” was not successful in a direct sense because, according to embassy sources with close ties to the PKB and lawyers involved in the case, Wahid’s supporters paid the judges 3 billion rupiah (about US$322,000) in bribes for a verdict that awarded control of PKB to Wahid instead of a dissident faction. However, Yudhoyono’s strategic objective was achieved as external pressure on Wahid’s “precarious position” forced the PKB to reposition itself to support the administration. The President reportedly also got BIN to spy on rival presidential candidates. This practice appears to have begun while Yudhoyono was serving as co-ordinating minister of political and security affairs in former president Megawati’s government. He directed the intelligence service to report on former army commander and Golkar presidential candidate Wiranto. Subsequently, at a meeting of Yudhoyono’s cabinet, BIN chief Syamsir characterised Wiranto as a “terrorist mastermind”. The leaked US embassy cables are ambiguous on the question of whether Yudhoyono has been personally engaged in corruption. However, US diplomats reported that at a 2006 meeting with the chairman of his own Democratic Party, Yudhoyono “bemoaned his own failure to date to establish himself in business matters”, apparently feeling “he needed to ‘catch up’ . . . [and] wanted to ensure he left a sizeable legacy for his children”. 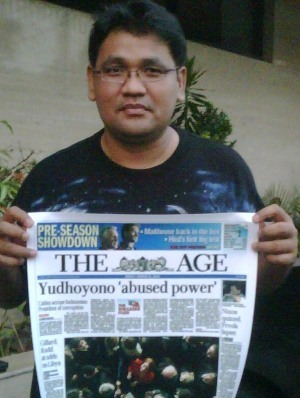 In 2006, Agung Laksono, now Yudhoyono’s Co-ordinating Minister for People’s Welfare, told US embassy officers that TB Silalahi “functioned as a middleman, relaying funds from Winata to Yudhoyono, protecting the president from the potential liabilities that could arise if Yudhoyono were to deal with Tomy directly”. Yudhoyono’s wife and relatives also feature prominently in the US embassy’s political reporting, with American diplomats highlighting the efforts of the president’s family “particularly first lady Kristiani Herawati . . . to profit financially from its political position”. In June 2006, one presidential staff member told US embassy officers Kristiani’s family members were “specifically targeting financial opportunities related to state-owned enterprises”. The well-connected staffer portrayed the President as “witting of these efforts, which his closest operators (e.g. Sudi Silalahi) would advance, while Yudhoyono himself maintained sufficient distance that he could not be implicated”. Yahya Asagaf at the State Intelligence Agency privately declared the first lady’s opinion to be “the only one that matters”. One prominent anti-corruption non-government organisation privately told the US embassy that it had “credible” information that funds from Bank Century had been used for financing Yudhoyono’s re-election campaign. Former vice-president Kalla strongly criticised the bailout, alleging that the Bank of Indonesia under Boediono had been negligent in supervising Bank Century and arguing that the bank should have been closed as its failure was due to fraud perpetrated by major shareholders. Against this background the US embassy reported that Yudhoyono was increasingly “paralysed” as his political popularity rapidly diminished. Over the past 13 years Indonesian democracy has undoubtedly strengthened. The Suharto dictatorship has been replaced by a competitive political system characterised by robust debate and free media. However, as the leaked US embassy’s reports show, in a partial glimpse of the inside workings of President Yudhoyono’s tenure, some of the secretive and corrupt habits of the Suharto years still linger in Indonesian presidential politics.